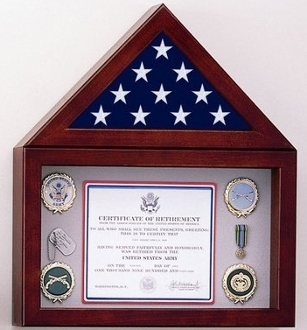 A combination Flag Display Case and Shadow Box, the FB-265 allows for the display of a grouping with the flag. Each display case features beautiful Appalachian Hardwood with an elegant Queen Anne Cherry finish, sturdy masonite backing, and 1/8" glass front. A silk-screened, paper, flag front is included for display. Velcro-compatible material is included in this piece. NOW ALSO AVAILABLE IN SOLID OAK WITH A GOLDEN OAK FINISH! Includes your color choice of Velcro-compatible material: Black, Burgundy, Camel, Gray, Green, Oyster, Red, or Royal Blue. Ordersfor the Flag Display Case with a Shadow Box are usually shipped out within one business day to places within the USA and Canada.